To make the dough, combine the flour, eggs, water and 1/2 tsp. salt. Knead mixture. Let rest for 30 minutes. Mix the ground beef, ground pork, onions, 1 tsp. salt, pepper and garlic together. Cut the dough into three equally sized pieces and roll each one into a cylinder the diameter of a finger. Cut each cylinder into pieces the size of a walnut, then roll each piece into a very thin flat cake with a diameter of about 2 inches. Put some of the ground meat mixture in the center of each flat cake (quite a lot, but not so much that you can't then seal up the dough). Then fold the dough in half and join up the edges to seal them. Pinch the corners together: you should now have a ravioli-shaped "flying saucer." Serve in soup bowls. I like to offer three dipping sauces: sour cream, creamy horseradish, and white wine vinegar. YUMMMMM! This recipe is delicious. I know you will like it. If you want to make it even more kid friendly, try serving with melted butter or marinara if your kids don't like sour cream, horseradish, or vinegar. I'd make them try all the sauces though just to expand their taste buds! John, I thought this sounds great But... if like me you DO NOT want to make the dough from scratch, you can now buy fresh round/square WON TON wrappers in the refrigerator section of your Asian OR local supermarket. 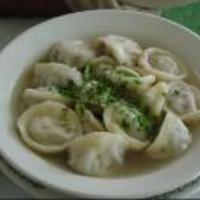 Yes I plan to make these Pelmeni as I like to eat them fried in butter YUMMMMMM!!! Kol from Altai and U.S.
WonTon wrappers?! Never! Make the traditional dough! And vareniki with cherry (or blueberry) IS, indeed, excellent!! I have been looking for this recipe for years. Love it so much. You have to make your own dumplings though. Best that way. I also like it with red wine vinegar. YUM YUM! These were delicious. I had to add more flour and would recommend salting the meat a bit more - but otherwise, very good pelmeni - especially for first-timers. We usually buy them frozen at our local Russian store. I loved them. I added an egg, 1/4 C beef broth and smoked paprika to the meat. Most excellent! Great suggestions, Grant. Glad you liked them! awesomeness!!! just like my great grandmother used to make them!!! thank you! do you cook the meat before putting it into the dough wrapper? Hi Denise, so sorry for the delay. No...you put the meat in raw. The cooking happens during the boiling. It keeps the meat moist and juicy. You are really going to love these! Sorry for the late reply Smokinhotchef! Thanks for the kind words and glad to have you as a groupie. Must post more recipes!! I'm not sure what I'm doing wrong - someone tell me. I make the dough as stated but mine is extremely wet, far too wet to knead - I just need to add a lot more flour. Anyone else have the same experience? I'm making them right now so will give a taste review later! Hi Sara...not sure why you're finding this...but adding more flour shouldn't hurt. Hope they turned out OK! Thanks! I did end up adding quite a bit more flour and plan to try again to see if things turn out better. Overall very good though, thanks for the recipe. Yeah, it's good thing! But vareniki with cherry extremely more exellent!